Pictish stone skills are not forgotten! Contemporary artist Barry Grove has created the following stones using Pictish images which still deliver a powerful reminder of that lost civilization! All these particular carvings are done using reclaimed sandstone and can be produced to any scale. 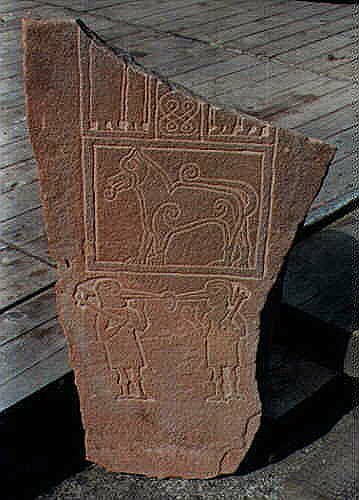 The Aberlemno Seahorses are copied from the famous Aberlemno Stone, located near the Cathedral Village of Brechin in Angus. The Papil Stone is a copy of real Papil Stone, located on the Island of Burra, Shetland (440mm*380mm*65mm). Barry Grove is currently working on a replica of the 'Hilton of Cadboll' stone. The work is to be erected in the site of the chapel where it is thought the original stone stood. British Archeology Magazine - Carved symbols point to the high status of Pictish women, argues Ross Samson in this article from April of 1995. The Pictii - Terrific page from "Britannia," lots of photos of people dressed as Picts plus good text. Pictish Stone Tests Museum Policy - Interesting article from British Archaeology, June 1996 on the removal of Stones to museums. Pictish Ogham Inscriptions - Complete list of all the known Pictish Ogham inscriptions. Valtos: brochs and wheelhouses - Archeological digs near Callanish, Isle of Lewis. Pictish Designs - A whole Pictish pictographic menagerie. Rulers of Scotland - Includes the Pictish Chronicles and lists all the Pictish Kings. Birth of a Nation - Pictish refernec page with some images. This is part of the Loch Ness Monster web site. 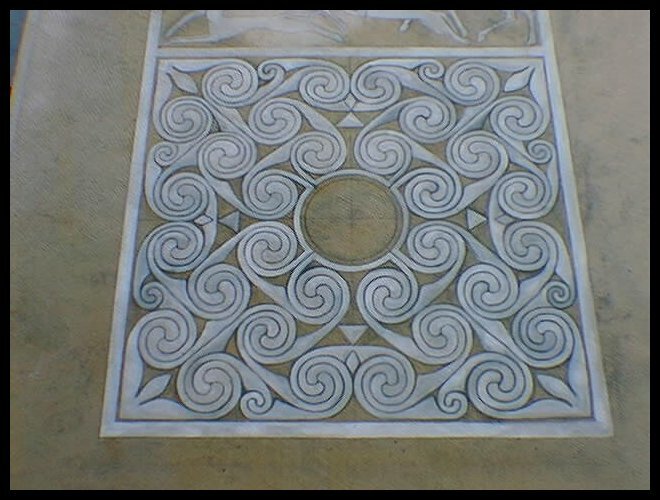 Pictish Art - A new site by Laura Cochrane. Several nice photographs and good text and links. Pictish Rituals - Another witchcraft page using "Pictish Magic." Christine Freelin's Pictish Jewelry - One of the best jewelers working Pictish themes. History of Comrie - Lots of Pictish references in this history. Deer Trap - A 1400 year old Pictish deer trap. Woad - An odd 1921 English Boy Scout lyric on the suspected coloring herb of the Picts. Conan Mud - The Picts in the fantasy literature of Robert E. Howard, who introduced the Picts to many young readers via the Conan stories. The Pictish tribe Smertae - An excerpt from W.J. Watson's Book, "The Celtic Placenames of Scotland" describing this Pictish tribe. Magic as Taught by the Picts - Unusual page from "The Big Book of York"
The Eradication of Bryth and the Fate of the Briton - An entymological essay by Toby D. Griffen. The Pictish Inscriptions of Scotland - A lecture by Katherine Forsyth, St. Hilda's College, Oxford. Razorwitch Pictish Witchcraft - A pagan, witchcraft site which uses "Pictish magic." Carvic Industries - Producers of Pictish recreations for the tourist trade in Scotland. Jaracraft - Based in Stromness, Orkney. Has been producing a wide range of crafts since 1991. 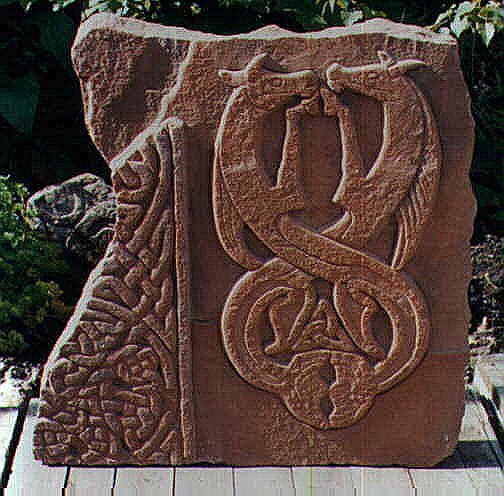 Specializes in Pictish and Celtic carved slabs and crosses. Hidden Facets of Pictish Symbol Stones - Radical new theory about the stones by Alligator Descartes. The Old Bank House - Cross Stitch chart and kit producer, situated in the small fishing village of Gardenstown in the North East of Scotland. 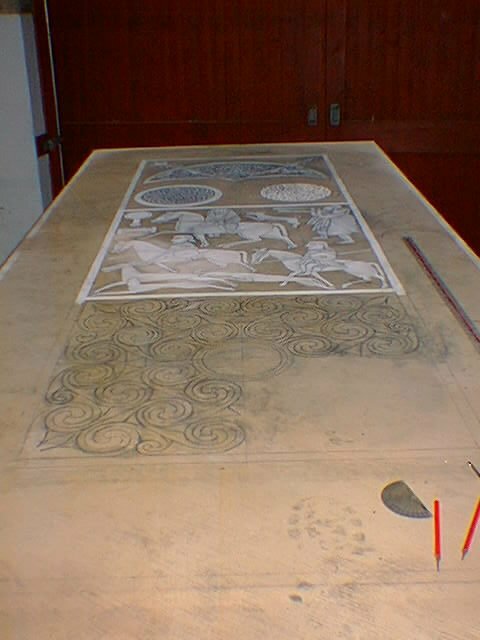 The products include the most elaborate and intricate representations of Celtic and Pictish Artwork.